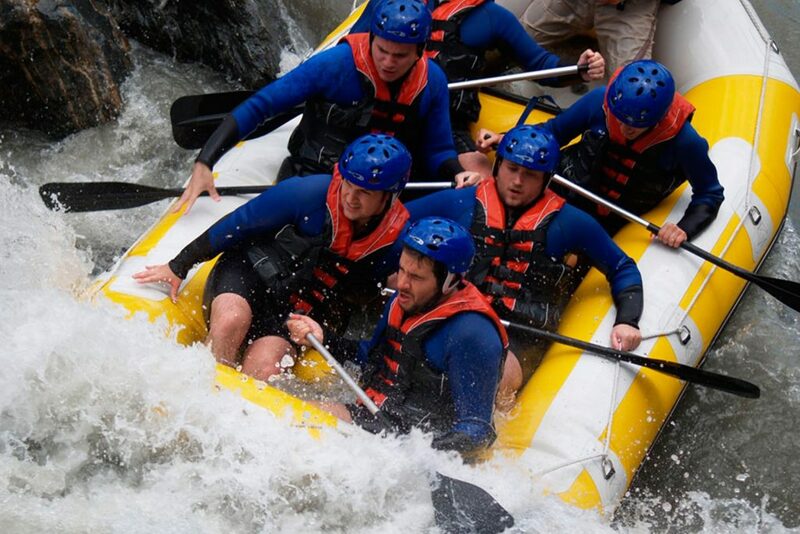 Rafting is one of the activities of leisure and active tourism with more followers in the world. Traditionally framed in the field of multi-adventure, it is an ideal sport for all types of public, consisting of the descent of rivers on board of inflatable rafts with a capacity of 6 to 10 people. The boat navigates the river led by an experienced monitor or guide with knowledge of the environment, taking advantage of the rapids and currents to make the group’s experience unforgettable. Do you have any doubt? Contact SaltaRíos! The difficulty of rafting depends on the conditions of the river chosen for the descent. In general, it is a dynamic multi-adventure activity that allows you to enjoy contact with nature and whose duration depends on the section chosen by the group. The rafting begins with a safety speech made by the monitor, which among other issues explains to the participants how they should sit (on the sides of the raft, which are fastened with existing anchors on the ground), which is the position to row or how to rescue a companion that falls into the water. In Andalusia, guided rafting descents are practiced in three rivers: Guadalfeo (in the Grenadian Alpujarra, Granada), Genil (located in Córdoba (Benamejí) , also in a section human-made in the city of Granada and finally at the location in Cuevas de San Marcos, Malaga) and Guadalquivir (in the Natural Park f Sierra de Cazorla, province of Jaen) The three offer good white water conditions for rafting and are ideal destinations for business incentives, bachelor parties, school programs and to enjoy contact with They are also perfect to enjoy a happy birthday or a bit of adventure. Rafting in Benamejí and Rafting Granada (Guadalfeo), are two of our specialties.